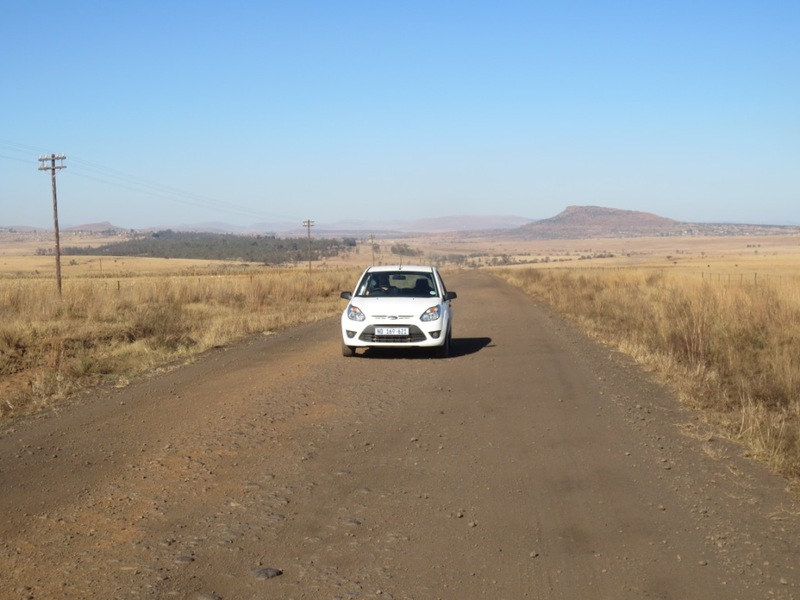 Just back from our mini adventure – wow, driving in Africa is definitely not for the faint-hearted! Driving out of Durban was like being in Gran Turismo, everyone drives so fast and if you can’t keep up, then the polite thing to do is get out of the way and drive in the hard shoulder! Despite pushing the little fiesta up to 110km/hr, we soon realised that our place belonged firmly in the hard shoulder so pulled over to allow everything else to pass us. This would have been fine, except you are then faced with trying to dodge all the people, market stalls, animals that seemed to line the motorway despite being miles from anywhere. Coming from a place which has a population of only 20million, we can’t get over how many people there are here! 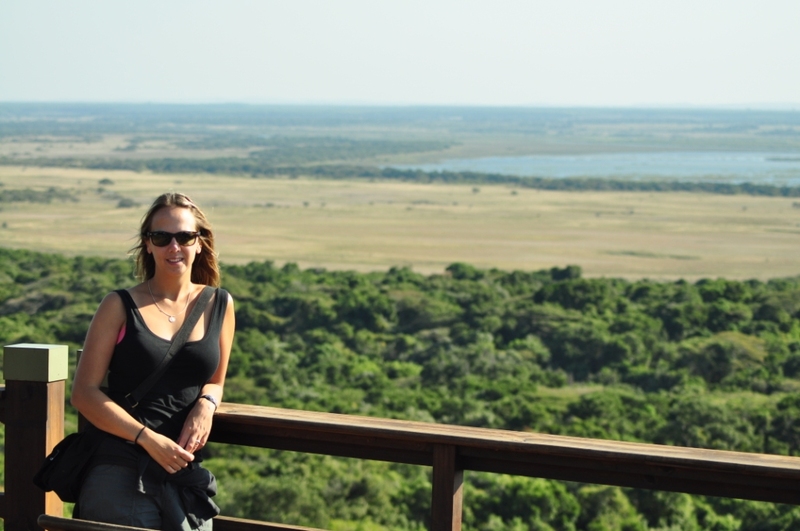 Our first destination was St Lucia, an incredible wetlands area and the first World Heritage site in South Africa. We arrived in the afternoon and although a blissful little place, unfortunately our accommodation was not what it looked like on the picture…well maybe it did 20years ago, but not now. Oh well, it was extremely cheap and once we’d fumed the room out with mozzie killer, it was just about bearable! It’s on nights like these we wish we had our comfy & clean bed in our tent! We are counting the days until Kylie is here! That said, it was pretty cool to sit on the balcony at night and here the hippos in the river just below us…our first African animal! 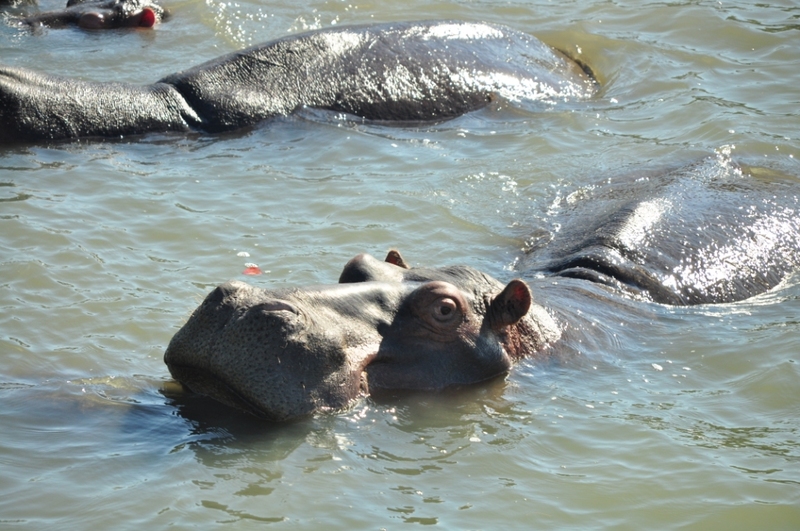 We took a boat trip the next day down the river to view the hippos close up – a fact i didn’t know was that hippos can’t swim! When you see them in the river, they are either standing in shallow water, or walking across the bottom and jumping up to the surface now and then to take a breath! Heading north we ventured up to our first game reserve – Hluhluwe-iMfolozi , the oldest reserve in Africa and credited with saving the white rhino from extinction. 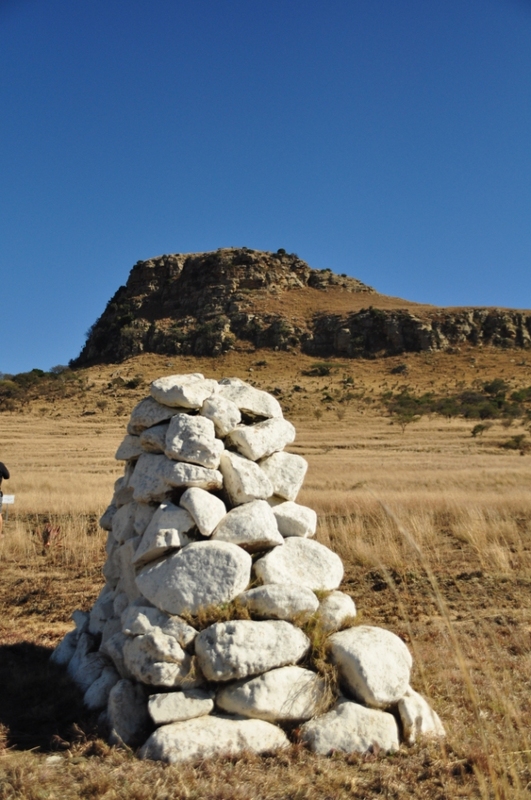 We stayed in Insinkwe bushcamp just outside the park – thankfully this one was fantastic! Driving into the park for the first time was exhilarating – you just didn’t know what would be around the next corner and being in a tiny fiesta only added to the excitement. 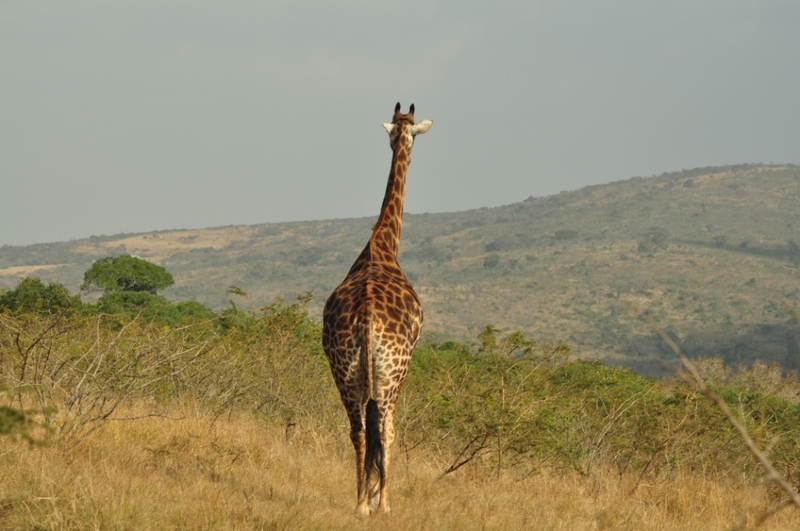 It must have been beginners luck, but in the first afternoon we saw 4 of the big 5 including both black and white rhino as well as giraffe, zebras and an assortment of different antelope. Our first encounter with an elephant however, was slightly terrifying, as we pulled up to the river’s edge, the dominant bull decided to charge out of the water straight towards the car in front of us. There was a mad panic as the cars all tried to get out the way, but luckily our little getaway car was amazing at reversing at high speed and we were soon able to breathe a sigh of relief! Our second close encounter was with a white rhino! Slowing down to check out 2 warthogs to our right, we didn’t realise that when they started running off, it wasn’t because of us, but a rhino charging full pelt towards us all from our left. Fortunately, the rhino saw us and turned in time to miss our car (which is a miracle considering how bad their eyesight is) and i only saw him as his horn was about level with the passenger window! How we all missed each other i don’t know, but it certainly made for one hell of a first game drive! We felt so privileged to have seen a number of rhinos on our trip they are under huge threat from poachers with the horn trade being bigger now than ever, fuelled predominantly by the demand for Chinese medicine. 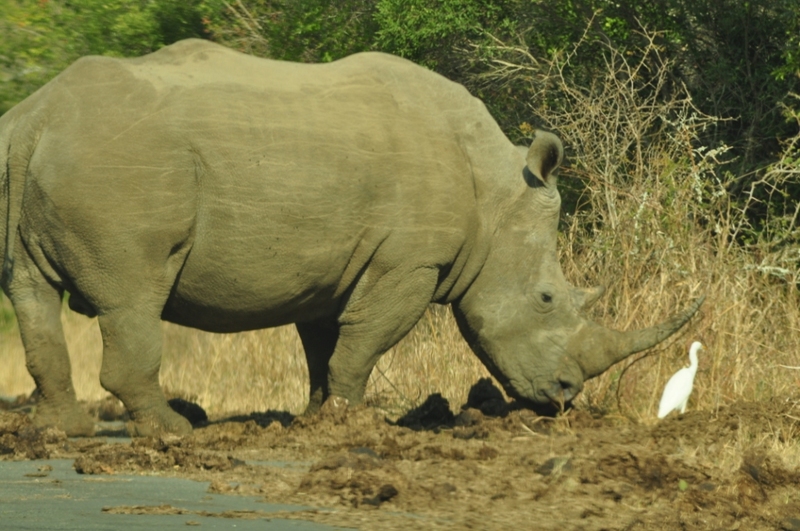 The game parks in South Africa are investing heavily to try and protect rhinos as much as possible and success stories of how many poachers have been caught or killed are banded about in the newspapers. However, with rhino horn commanding such a high price it seems the risks are worth taking for poachers and the risk of getting caught is not a strong enough deterrent . If rhinos are to survive extinction, there needs to be more focus on tackling the source of the problem, not just the poachers who are simply supplying the demand. 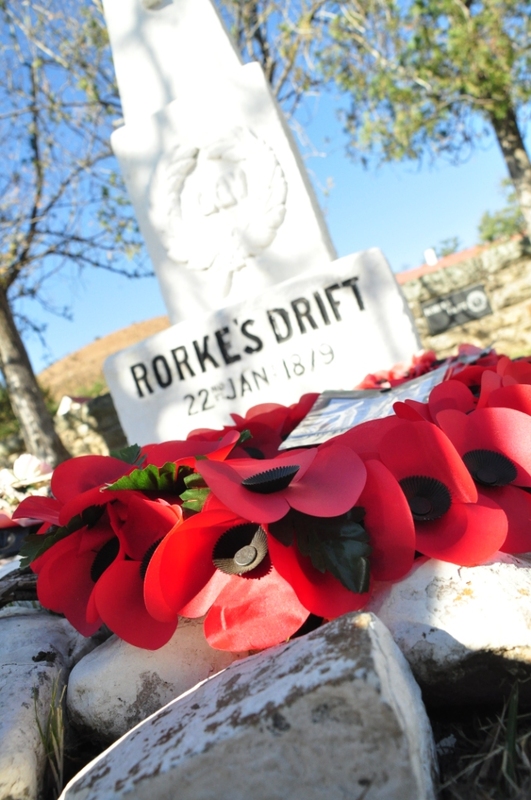 After our animal encounters, we took the drive 4hours north to the battlefields, for a history lesson on the Anglo-Zulu & Boer wars. The scenery was just spectacular, with rolling green hills covered in lush long grasses – the livestock here look a lot healthier than those in WA! Driving through the rural villages, it’s hard not to be shocked by the poverty that sits just outside of the city. The disparity in wealth is unbelievable. From big mansions, well healed people and flash cars, to the small thatched circular huts , roaming cattle & ladies sitting on the verges cutting the grass with scythes. 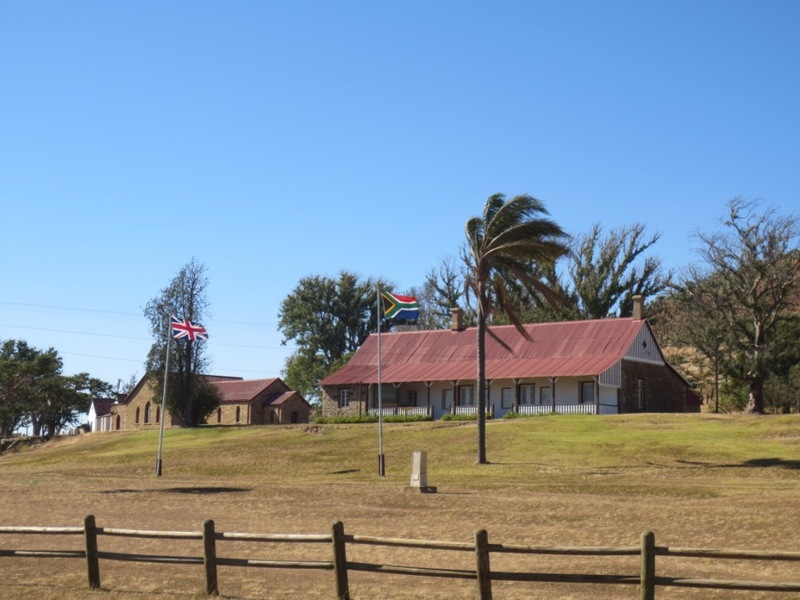 We stayed in Dundee and were fortunate to meet Evan Jones the local historian who told us a lot about the history of the area and the battles at Islandwana and Rorkes drift, made famous by the film Zulu. He was keen to point out the inaccuracies of the film in detail, i didn’t like to say that i hadn’t seen it, but fortunately Rich had! He really helped to bring it all to life for us and made the visit to the battlefields a lot more interesting! We’re now back at our base in Durban waiting for the car. Apparently it arrived on Tuesday, so we are now in constant contact with our agent to work out when it will be offloaded and through customs. Maybe tomorrow? Maybe not? This is Africa time now. **Update as i post this. We found out yesterday that to get the car released we also needed the original copy of our ‘Bill of landing’ which we only have as a soft copy. The Australian shipping agent had failed to mention we would need this, so once again they have let us down and left us ill-prepared. Fortunately our shipping agent this side is being fantastic and has managed to arrange a permission to release without original paperwork and we could have the car by this afternoon!! love the way your writing your story……. am interested to know ‘who’ was suppose to give you the ‘bill of landing’…. it sounds like it is suppose to be the Aussie side. ??????? what exactly is it for or meant to do. The bill of landing is the receipt/proof that the item has been loaded onto the ship. The Australia agent emailed us a copy once the car had been loaded, but we were not given the original ‘yellow’ copy – so make sure you request this from your Aussie agent. Apparently you must have the original to get the car released, but fortunately our agent here has managed to get approval from the shipping company that our copy is indeed a true copy of the original??? Alternatively ask your shipper for an “express release Bill of Lading”. That way you do not need the yellow hard copy – e-mail is sufficient. Just back from the port-we have our car!yes, documents need to be stamped with express release or alternatively you can request a waybill. Great photos, how did you manage in pronouncing all those unpronounceable names !! We are learning new things everyday, but everyone we have met have been so helpful, even if we pronounce everything ver badly!